Arthroscopy is a surgical procedure where an instrument called an arthroscope is inserted through a tiny incision in the body. The device is fitted with a camera at the end that will let the surgeon view the area of surgery on a television screen. 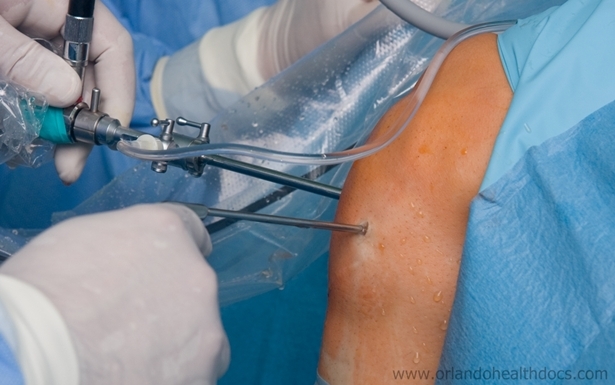 Shoulder arthroscopy as the name suggests is an arthroscopic procedure performed on the shoulder. There is a group of muscles and tendons that hold together the shoulder joint called the rotator cuff. They hold the ball and socket joint in the shoulder and aid in proper movement. However, the tendons can tear due to overuse or accident. This is very common among sports persons as they are involved in rigorous physical activities. The anaesthesia in arthroscopic surgery depends on the patient and is decided by the anaesthesiologist. Most people are put under general anaesthesia but in some cases regional anaesthesia is also used. People who are put on local anaesthesia are also given medicine to make them very sleepy during the procedure. You should check whether the brand of medicine you take has these in them. You should also stop taking other drugs and inform the doctor about it. Your doctor can also tell you which drugs are safe to be continued during this period. If there is a medical condition such as heart disease or diabetes for which you are undergoing treatment, first you should meet that doctor and tell him/her about your impending surgery. It goes without saying that you should stop drinking and smoking prior to the surgery. This is because smoking and drinking can slow down the healing of the bone and the surgery wound. In case you get a cold, flue or fever before the surgery, inform your doctor about it. On the day of the surgery, be confident and do not drink or eat anything 6 to 12 hours before the procedure. In case if there is a drug prescribed to you by the surgeon, take that with a little amount of water. Repairing the Rotator Cuff – In this process, the surgeon will bring the edges of the muscles together. Sometimes rivets known as suture anchors are also used to help with attaching the tendons to the bone. The suture anchors come in either plastic and metal form and need not be removed post surgery. Impingement Syndrome Surgery – This is a process where the tissue that has been inflamed or damaged is cleaned out of the area above the shoulder joint. The under side of the bone called acromion can be shaved off and specific ligament called coracoacromial ligament can be cut. Shoulder Instability Surgery – The surgeon can repair the torn labrum, which is the rim of the shoulder joint. The surgeon can also repair the ligaments that are attached to this area. There is a form of tear called the Bankart Lesion on the labrum in the lower part of the joint. Yet another lesion that occurs with the labrum and the supportive ligaments is called SLAP, which stands for Superior Labral tear from Anterior to Posterior. Depending on the kind of tear you have and the complications involved, the surgeon will perform any of the procedures mentioned above. Once he/she has completed the procedure, stitches will be used to close the incisions. Certain surgeons also take pictures for future reference during the surgery. The recovery time post an arthroscopic shoulder surgery can vary from 1 to 6 months and for the first week after the procedure, you may be required to wear a sling. Depending on the extent of the damage and the repair done, the patient may have to wear the sling for an extended period. The doctor will prescribe pain killers to control the pain in and around the wound. It won’t be possible to return to playing sports or involve in heavy physical activity unless the prescribed rest period is over and the surgeon confirms that the wounds have healed 100%. It is not only enough to rest but also involve in certain physiotherapy sessions that are designed to regain motion and strength in the shoulder. Shoulder arthroscopy is considered an alternative to the more open surgery, which exposes the joint. This procedure is less painful and has fewer complications. It also requires the patient to stay for less time in the hospital and the recoveries are fast. The recovery time may extend as much as an open surgery depending on the complication. Though surgery can bring back stability in the shoulder, some people may get an instability after the arthroscopic procedure. Further, though the surgery can relieve pain in the shoulder, some people may not regain all the strength in the joint. The patient should also be ready to switch to an open surgery if the damage is more severe than one that can fixed using a shoulder arthroscope.